Inspired by the pages of the magazine, this book is all about fun, easy cooking: Each recipe is short and simple—just a single paragraph!—and every page is filled with great photos and tips. Bonus: Check out the “centerforld” at the end of each chapter for a great classic recipe, like perfect marinara sauce and s’mores. Keep this amazing new cookbook next to the stove and you’ll never run out of ideas! Food Network Magazine’s second cookbook is packed with more than 1,200 recipes. Choose from hundreds of fun appetizers and snacks, tasty dinners and sides, and easy desserts and drinks. 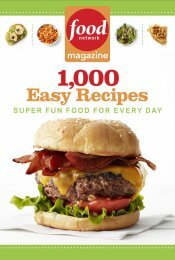 The new cookbook FOOD NETWORK MAGAZINE 1,000 EASY RECIPES: SUPER FUN FOOD FOR EVERY DAY sounded like an ideal cookbook for me. One thousand easy recipes for every day... what could be more perfect for a busy mom who has little time each evening to prepare dinner? Plus, I've always been a big fan of the Food Network and its magazine, so I thought this cookbook was definitely worth a peek. I don't usually just sit down and start reading a new cookbook. I tend to skim through it at least once before reading every recipe from the beginning. My initial impression of 1,000 EASY RECIPES was that it was a wonderful cookbook. There were lots (and I mean lots) of beautiful color photographs of the recipes. I don't think that there is a page spread that doesn't have at least one big photograph. I'm sure that many of you will agree with me that color photographs of the prepared meals are a definitely plus when it comes to rating cookbooks. In addition, these photos aren't your ordinary boring photos of food. They are absolutely gorgeous and I found myself getting hungry while looking at them. After I stopped drooling over the pictures, the next thing I noticed were the recipes themselves. I don't mean the types of recipes. Rather I mean that each recipe was only a paragraph long, and often times, just a sentence. Talk about simple and quick! The ingredients are listed in bold so the reader can identify them quickly. Another interesting tidbit is that many of the recipes are pretty general and don't give specific amounts of ingredients. I am one of these cooks who are very comfortable with exact directions, so that initially threw me for a loop. However, upon a further look, most of these recipes are so simple that you can just throw things together without measuring. 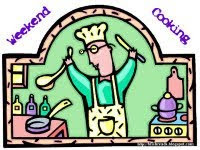 Furthermore, it allows you to cater the recipe to your particular taste. As far as the recipes go, there are plenty of good ones in 1,000 EASY RECIPES. There are a ton of ideas for entertaining and snack foods which I appreciated; however, I admit to being a little disappointed that there wasn't the typical chicken main meal section because that's where I usually find the most new recipes to try. I think the thing to keep in mind is that these recipes are super-easy. I found myself marking quite a few recipes and I ended up trying the Penne Alla Vodka one. It was extremely easy and very good, and I was excited that I still had enough sauce leftover to freeze for another meal. (That's always a bonus!) My husband did point out to me that I really didn't need a recipe to make pasta sauce, but I assured him that I appreciated this cookbook's guidance. I definitely enjoyed 1,000 EASY RECIPES and I do think it's a worthwhile cookbook to own. I just have to warn you that it's not your traditional cookbook for main meals, but I do think you'll find lots of fun recipes to use with kids and when you entertain. Thanks to SallyAnne McCartin & Associates for providing a review copy of this cookbook. Despite not having some the typical main-meal recipes, the book sounds like a good reference. I love the descriptions of the photos and the setup of the book. I often use cookbooks for ideas rather than exact recipes, so maybe this would be a good match for me. Easy and quick sounds like a winner to me! I wonder if Vance would enjoy this cookbook. I just saw this advertised the other day and was wondering if it was worth picking up. I think I'll borrow it from the library first and then decide. Sounds like a fun and useful cookbook to have around. .. maybe good for getting the kids started with cooking, too!